The Queen of Pentacles represents both a down-to-earth woman who plays many roles to ensure that she keeps her family happy. She knows how and when to show love - keeping an orderly home, cooking comforting meals and takes care of the children. But do not mistake her for being only a homebody - alongside all these motherly attributes, she can plan business ventures and execute her plans successfully. It is through her naturally talented business sense that she is surrounded by such luxury. She is quiet and does not like disclosing her financial accounts, fearing that it could bring more complexity to her life, which she desires to keep rather simple. She may have a secret bank account that nobody knows about - for she may choose to be careful, vigilant and self-sufficient. But do not mistake her for being only a homebody - alongside all these motherly attributes, she can plan business ventures and execute her plans successfully. The Queen of Pentacles therefore represents a motherly figure who desires to help you maneuver your way and achieve your goals with a the helping of her common sense. She will not only show you love, but she will also show you the way forward whenever you seem to be stranded and confused. With her advice, she will ensure that you do not make dangerous financial decisions. She offers you precautions, principles and support, all lessons that she has learned in her personal life. Because she is a self-made woman, she wants too for you to be independent and wise, such that you are also able to raise others and make them responsible. 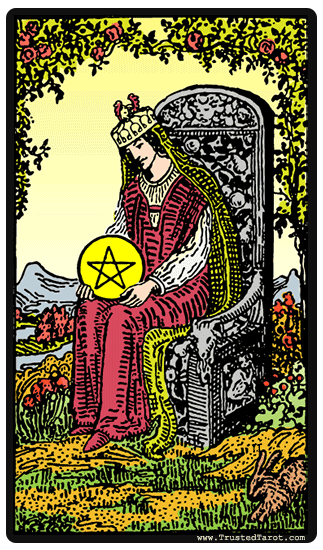 When the Queen of Pentacles becomes disconnected with the energy of her suit, she can become someone who is completely self-absorbed. Gone is the upright generosity in her suit, she can be selfish and even envious when others successes seem greater than hers. Upright, her home is usually a sanctuary for her guests, but reversed it may instead be slovenly - she loses the ability to take care of herself and her surroundings. Her focus on the material may manifest negatively, making her greedy, and yet lacking in her sense of duty and capability. How can she ground herself again, how can she re-enter the sacred relationship she naturally feels with the earth and all its living creatures? The Queen of Pentacles reversed may also indicate that you have misplaced priorities, which may eventually be compromising to your future. You may find yourself distracted and unable to focus on your work and your long-term goals. You could also be busy working on projects without taking time to consult experienced people who can guide you away from mistakes. This card could also suggest those that you care for are now ready to become accountable and responsible for their own lives. You must learn to let go and given them their independence - the role of caregiver is most rewarding when your loved ones have grown strong enough to make their own decisions.